PT. Soli Deo Gratia, a limited liability company incorporated under the laws of the Republic of Indonesia. 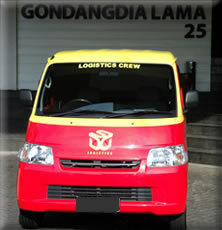 Founded and established by Ardin Sitorus, a legal consultant and an entrepreneur in responding to the fast growing and developing of consumers goods trade and logistic delivery services both in the country and abroad, which demanded the need for delivery and logistics services in today’s global market era. By always providing a safe, fast and accurate time services to its consumers, PT. Soli Deo Gratia was grown and developed very rapidly. Today, we are proud to be one of the national leading logistic and delivery services in the country and currently expanding link of our services over the countries in the world in compliance with the international standard delivery and logistics services industry. The name of the company “Soli Deo Gratia” is drawn up from Latin words that means only by the grace of God. This value becomes the core stone of corporate culture values of our company. We worked hard to serve the customers with heart and service excellence. By the passage of time, working throughout of all our experiences the network of our services has been growing larger and larger which covered almost the provinces and cities all wide Indonesia. In todays extremely competitive, fast paced retail environment, the growing and the development of the company was going very sound and remarkable. We strive looking for more challenges and open opportunities in the years to come with the globalization and free market era especially in the Asian countries. PT. Soli Deo Gratia headquartered is located Jalan R. P. Soeroso Menteng, Central Jakarta, with branch office at JPT building Soekarno Hatta International Airport, and representatives offices in 33 provinces in Indonesia and in 5 (five) continents. Now our networking services has been connected to more than 200 cities and towns in Indonesia also to over 200 destinations countries over the world. PT. Soli Deo Gratia offers expertise in delivery, air freight, sea freight, inter-regional transportation; logistics contract solutions, international mail services, export and import consulting services. PT. Soli Deo Gratia is supported by qualified and experienced human resources, expertise in their fields and focused on the customers’ needs and always provides the right solutions to their problems. Therefore we can continue to dedicate and deliver service excellent all to the satisfaction of our customers that we believe it is the main key to the success of our company.